Online Alabama Censuses & Substitutes - A Genealogists' Insta-Guide, by William Dollarhide; 2017; 4 pp; 8.5x11; laminated; ISBN: 978-1-62859-166-8; Item #FR0375. This Insta-Guide is an extracted list of bibliographic entries from Dollarhide’s Alabama Censuses & Substitute Name Lists, 1702-2014 (Family Roots Publishing Co., 2017). The 136 censuses & substitute name lists herein are in chronological order. They include territorial, state, and federal censuses; histories, newspapers, court records, directories, tax lists, and vital records. The 112 online database entries each include a link to an Internet website with a searchable database. The 24 print & microfilm entries each include a link to the applicable Family History Library (FHL) online catalog page. 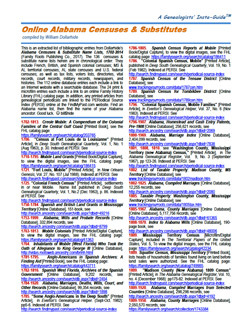 And, printed articles from genealogical periodicals are linked to PERSI (PERiodical Source Index) at the FindMyPast.com website. This printed item currently comes with a FREE immediate download of a PDF ebook of the same.